We have had a busy time in the UK with the Jubilee celebrations. 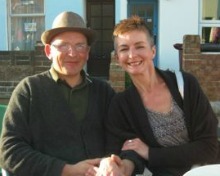 Here's a little picture of my partner Karen and I at the Jubilee party in our road. Personally I am not a royalist but our own street party was a great way of bringing together all the different people who live in our area. We had the road closed and cleared of cars for the afternoon. How noticeable that the minute the cars were gone out came the kids - scooters, skipping, chalking on the pavement and a street long game of football. None of this was organised all they needed was a safe place to play. Makes you very thoughtful about how we run our lives and plan out the areas where we live. When we did sort out some activities for the children it was the old favourites that were a real hit. Doughnuts on strings is always a winner and we also had lots of fun with a play parachute. The real highlight of the day however was the Scooter Parade which we used to start proceedings. All the children had decorated their scooters and themselves in all sorts of wonderful ways. We lined the adults along either side of the street and the kids (and one game pensioner dressed as Britania) scooted along whilst everyone cheered and clapped. The whole thing made more memorable by having the theme to the Dam Busters playing. At the end of the street the town Mayor took the 'Scooter Salute!'. It was brilliant fun and very very funny. A totally wonderful way to start off what turned out to be a great day for all the community. If you are looking for an easy but popular addition to any fundraising event you are organising I recommend a Scooter Parade it was a real winner! And now everyone is starting to get excited about the Olympics coming to London. The Olympic torch is making its way around England, Scotland, Northern Ireland and Wales and organisers have planned a route that tries to take in as much of the country as possible. The media of course concentrate on the various celebrities carrying the flame at certain spots. I think this is inevitable as The Games and all that surrounds them becomes ever more corporate. What is nice however is that the majority of torch carriers have been nominated by their communities for the good works they have undertaken or charities they have been steadfast supporters of. This is a great way to reward and honour those who put so much of their time, effort and enthusiasm into the good causes that build a better community. 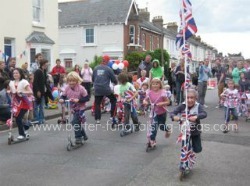 We are delighted that Anthony Stewart a stalwart of a number of local children's' charities and a friend of this website will be carrying the Olympic torch through our home town of Chichester in the South of England. We will try to include a photo in the next edition of Better Fundraiser. Whether in the UK or not I am sure many of you are planning to incorporate an Olympic theme into your summer fundraisers - if only re-naming some of the stalls at you Summer Fair. If you come up with any good ones please do let us know and we will share them on the site. Anyway if you have used Smencils as a fundraiser please let us know how you got on good or bad. Little tips and tricks from anyone in the fundraising world can be a great help to others looking for ideas and inspiration. 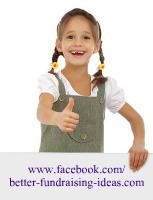 We reported last time that we had now set up a Better Fundraising Ideas Facebook page. All seems to be going well and we are busy posting pictures and information for some of the things we have been getting up to in our search to sniff out all the best fundraising ideas. If you are a Facebooker please visit our page and don't forget to "like" us while you are there and share with your friends. The Queen doing Splat - The - Rat! There is a lot of competition out there in the world of fundraising. Competition for participants in fundraising events, sponsors and supporters, press and publicity and also of course for cash. It is therefore ever more important that anyone planning fundraising events tries to make their fundraiser a real attention grabber. This might be by putting on an event that has never been done before, or finding a way to attract more participants to an existing event. Another solution is to come up with a novel twist on an old favourite. Sponsored walks are a good case in point. Few charities would now put on a simple sponsored walk. Instead these days we have Moonlight Walks, Elvis Walks, Walks wearing Bras etc. 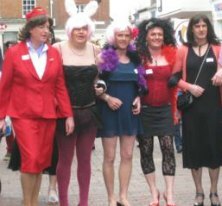 If a bunch of hefty lads walking a mile in stilettos doesn't get the local press jumping all over your fundraising event I don't know what will! Well the Victoria Sponge is the classic from the village fete. The cake by which all others are judged and the subject of fierce rivalry by Women's Institutes (check out the film Calendar Girls) and bake sale supremos across the land! It always looks a bit special but actually is pretty straight-forward to make. Buttercream icing - Use an electric mixer to beat 115g of unsalted butter into 500g of icing sugar, 60ml of semi-skimmed milk and 1tsp vanilla extract. Sift the flour, sugar, cornflour and baking powder into a bowl and mix well. Bake in the centre of the oven for about 25 minutes. The cakes should be raised and golden brown. if you insert a skewer into the centre of a cake it should pull out clean. When they are cool decide which one will make the best base and top. If the top of the base is a bit too domed carefully slice off the top. Place the base on a plate or cake stand and spread the top with buttercream. Hold the other cake (the top) upside down and spread its underside with jam. Carefully position the top on to the bottom so jam and cream meet in a sticky embrace. Served with a nice cup of tea or coffee a Victoria Sponge is definitely a "Bake Sale Banker!"